Kogod's Financial Management Association (FMA) hosted a student alumni panel in mid November focused on giving club members a firsthand account of what steps to take and what to expect when interning for major corporations such as J.P. Morgan, EY, and CitiBank. The panel consisted of current Kogod seniors who are graduating and beginning their careers at these firms. The panelists discussed what courses helped them the most, what opportunities they benefitted from and a few challenges and rewards that they faced with their schoolwork and internships. A successful turnout allowed students to network with each other and share their personal experiences while learning about finance internships. "As I start my path toward a career in the banking industry, the most helpful action that I can take is to connect with students who have worked to obtain the career progression that I, too, seek for myself," said Baxter Black, BSBA '18. The FMA Club plans events such as the student alumni panel every semester. 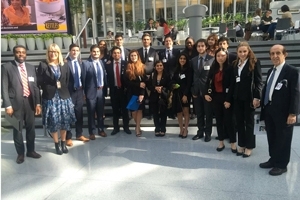 FMA is already planning events for the Spring 2016 semester, including a Bloomberg Certification session and a second New York City networking site visit. For more information on the Financial Management Association and their upcoming events check out the FMA Facebook page to learn more.